Best VPN for Online Game: Doom 4 early access and special offer: How to unblock earlier and buy cheaper Doom 4 with VPN? Doom 4 early access and special offer: How to unblock earlier and buy cheaper Doom 4 with VPN? Doom 4 is an upcoming first-person shooter video game which will be available on Windows, PlayStation and Xbox on May 13 2016. I suppose that many gamers are dying to play earlier Doom 4 as soon as possible and seek a discount price for Doom 4. This article will help you buy cheaper Doom 4 and get early access. How to buy cheaper Doom 4? I've found a special offer for Doom 4 on Steam. 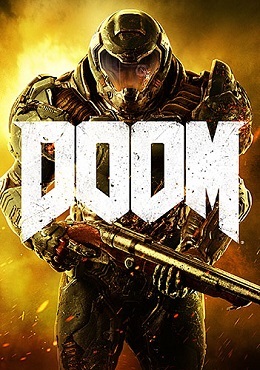 By visiting the following link( https://www.g2play.net/product/255320/doom-ru-vpn-required-pre-order-steam-cd-key/), you'll be able to buy a Doom PRE-ORDER Steam CD Key on G2Play. According this website, you can buy Doom 4 with €29.97 with a Russia VPN, while the current price for Doom on Steam is US$59.99! 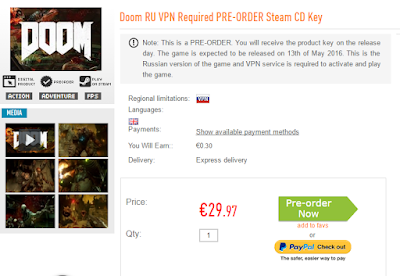 Although a Russia VPN is required both in purchasing and playing the Doom PRE-ORDER Steam CD Key, this game will be available in English. So there is no need in worrying about the language issue. How to unblock and play earlier Doom 4? It is said that gamers can use a USA VPN or a New Zealand VPN to unblock and play earlier Doom 4. I'm not quite sure whether it's true, but why not just have a try? I personally think that the "version of New Zealand VPN" does make sense, since a New Zealand VPN did unblock, especially on Steam, many games several hours earlier. When it comes to the "version of USA VPN", it could be also true since Doom 4 is developed and published by American companies. You may use a free VPN service to try to unblock and play earlier Doom 4. There's nothing to lose anyway, is there? If you have any question about how to unblock and play earlier Doom 4 and how to buy cheaper Doom 4, please leave a comment. Thanks for your attention.